Are you tired of the boring freezer dinners at the grocery store but don’t want to have to spend a fortune going out to a restaurant? YES! That is a question I ask myself practically on a daily basis. I am so excited that T.G.I. 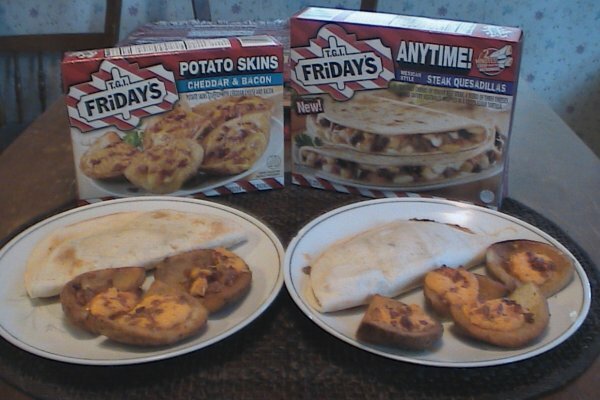 Fridays meals are available at the grocery store because I love going to T.G.I. Fridays but we don’t get to go there very often. First of all, they are so popular that it can take half an hour or longer just to get a table and I really hate waiting. My diet has gotten so boring and I’ve seen these T.G.I. FRiDAY’S “Entrées for One” in the freezer section at Target for only $2.79 each and I bought a couple. I was actually quite excited when I saw these because it gives me the chance to eat restaurant food at home. I bought the Sizzling Chicken Fajitas (picture above) and I’m not really a huge fan of onions or bell peppers but if they are cooked enough then they don’t really bother me. I figured that T.G.I. Fridays wouldn’t give me under cooked food so I took the chance and I’m glad I did because it was really good. 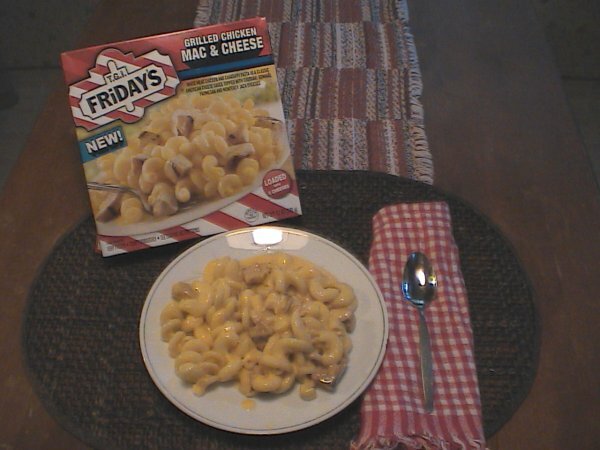 I also bought the Grilled Chicken Mac & Cheese (left picture below). If you know me then you know that I am a macaroni and cheese fanatic. I have loved mac and cheese since i was a kid and I think it will my be my favorite until the day I die. The other brands in the frozen section are good, one brand in particular is my favorite but it’s so expensive. The T.G.I. Fridays grilled chicken mac and cheese is SO much better. It’s not too much food and it has chicken. The cheese is a different flavor which is perfect because it’s not so boring. I also bought some T.G.I. Fridays snacks. I bought the potato skins with cheddar and bacon and steak quesadillas. (right picture below). Hey, we can’t have T.G.I. Fridays without appetizers. I mean seriously. Hey, did you know that T.G.I. Fridays is having a Fun Freezer contest on their Facebook page? All you have to do is decorate your freezer, take a picture and enter it in the contest and hopefully win one of a few prizes, it’s really that simple. So what are you waiting for? Go to the freezer section of your grocery store and pick up some of these “entrees for one” for dinner tonight.